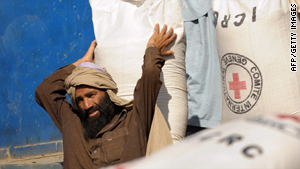 Men load foodstuffs during ICRC food distribution in Kunar province, east of Kabul on October 8, 2008. (CNN) -- The International Committee of the Red Cross is defending its practice of providing medical training and basic medical supplies to the Taliban in Afghanistan -- saying it is in line with the ICRC's mandate not to discriminate between different sides in a conflict. In the latest situation report issued Tuesday, the Red Cross disclosed that in April its workers "reached over 100 Afghan security personnel, over 70 members of the armed opposition, taxi drivers involved in the transport of wounded people, first-aiders and its own staff." That prompted plenty of quizzical and some critical comments in the international media and among bloggers -- and some grumbling among Afghan officials. But an ICRC spokesman in Geneva said the practice is consistent with its obligation of neutrality and its mandate to provide assistance to all sides in conflict. The ICRC says it provides a three-day course that includes lessons in international humanitarian law, practical work with bandages and other basic medical techniques. It says the course is also a chance to remind all sides about respect for civilians and proper treatment of detainees. Some critics have drawn a distinction between providing medical care to the wounded and training insurgents to do so. But the ICRC says it has provided similar training in Darfur, Sudan and to Hamas members in Gaza. ICRC spokesman Christian Cardon says it has been providing such training in Afghanistan for about four years to the Taliban as well as to Afghan police and civilian first-aiders. He added that the ICRC was not training the Taliban in surgical skills; the focus was on stabilizing those injured. The ICRC says that roadblocks, fighting and mines have made access to hospitals very difficult -- especially in provinces like Helmand and Kandahar in the south of Afghanistan. The International Security Assistance Force says it has no issues with Red Cross workers training insurgents in medical care. "We recognize the need for their work to be executed impartially -- and it's precisely for this reason that they are able to gain the access that they do," Lt. Col. Joseph T Breasseale told CNN. "One of the litany of things that separates the international coalition from the Taliban is that we have frequently provided first aid to injured Taliban fighters and we will continue to do so." The ICRC says the three-day first-aid courses are a small part of its program in Afghanistan. In April it conducted a war surgery workshop for dozens of doctors, and supported the regional hospital in Kandahar in performing almost 1,000 operations. The ICRC says it has 1,500 national and 140 international staff in Afghanistan.